Ancient Stones - Lothian - 025 Standing Stone, Ravenswood Ave, Edinburgh. 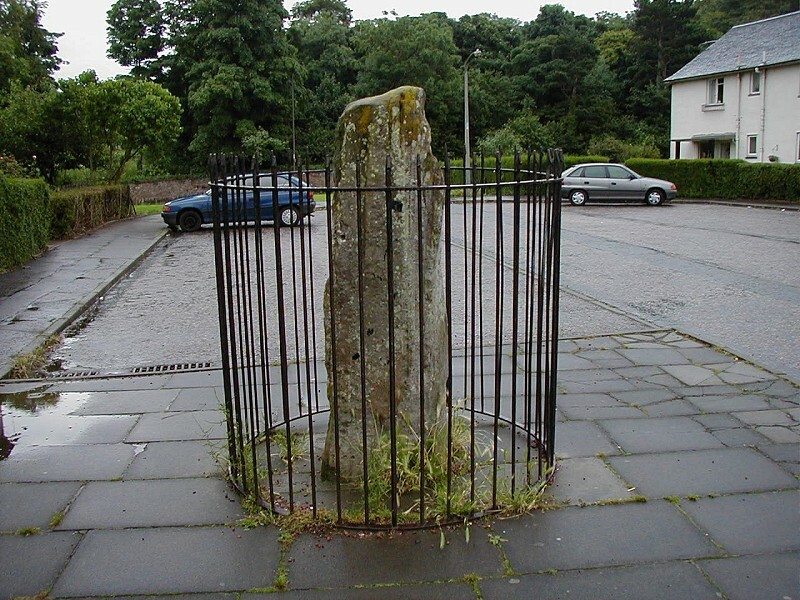 This standing stone is 2.06m high and it has a girth of over 2.00m at 0.90m from the base. Its main axis is almost due north-south, but with a slight inclination towards the east. It is of grey sandstone, badly weathered on two sides, and without any artificial markings. It was moved a few yards from its original position (in the present roadway) and set in concrete, protected by a railing, during the construction of the housing scheme in the vicinity. Ravenswood Avenue is located to the east side of Edinburgh. It is difficult to give directions for and the use of a street plan is highly recommended. This standing stone while protected by 6ft metal railings and despite being located slap-bang in the middle of a modern housing scheme, still hints at past glories. Not so long ago this was open fields and one might have been able to envisage just why this stone was erected here. Not far away at The Inch, stands another stone, perhaps both once formed part of a greater complex? Some word play may also throw some light on the subject. The word "Inch", an enclosed place, may be a corruption of "Innes", a Gaelic word meaning place enclosed by water, land, a fence or hills. It may also mean island, lake, fold or even stone circle! One wonders?